ARE YOU SURE that we are the Church of God? ARE YOU SURE that we are, definitely, the true Church of God! Have you read, in the Autobiography being published in The PLAIN TRUTH, that I, myself, more than thirty years ago, was puzzled about the question "WHERE is the one true Church which CHRIST founded, and of which HE is the living Head today? After some years I discovered, not only where, and which, was the one true Church — but also that I was actually in it! How did I know? How did I recognize it? And foremost among those identifying fruits is the statement of the resurrected Jesus, applying to this Church, in Revelation 3:8: "I know thy works: behold, I have set before thee an open door, and no man can shut it; for thou hast a little strength, and hast kept my Word, and hast not denied my name." Being faithful to GOD'S WORD is the chief qualifying requirement. That includes believing God's Word, and proclaiming God's Word — but also obeying it, being faithful never to compromise with it, actually living it! In my personal life, during the early years when this Church was insignificantly small, the temptations to compromise with it, depart partially from it, reject portions of it, or just "stretch it" a wee bit, were almost as many as the persecutions for being faithful to it, and refusing all compromise. If mistakes are made and it is human to err — we must be ready and willing, and sufficiently yielded to God to correct the error or repent of the wrong. And that, this Church has done and still does. 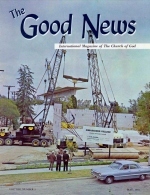 In the April, 1964, issue of The GOOD NEWS, there was an error in expounding the Word of God. This error was not realized by the man who wrote it. In his eager zeal he wrote what he assumed to be true. Indeed, it may have appeared to be the correct exposition of the passage to most readers. As Editor of The GOOD NEWS not only, but also of The PLAIN TRUTH and the Bible CORRESPONDENCE COURSE, it might be expected to be my responsibility to check carefully all manuscripts for all these publications before they are set to type. But there are not enough of me to do that — beside all the other responsibilities. And somehow, this particular manuscript got by the Executive, Managing, and Senior Editors without being caught. Yet when I read it in print in the magazine, after returning again to England, I was really shocked with dismay to read such a glaring misuse of a passage of Scripture in God's own publication for His Church! It is, in fact, what I should have expected to find in the journals of this world's churches. Had I read it in one of them, I should have considered it another example of their twisting and wresting the Word of God. But for those who really do TREMBLE before the sacred Word of GOD, such careless and misleading use of a verse of Scripture should never occur. I am personally grieved, mortified and hurt that it did — and I am shoving aside all other work, pressing though it is, to type this Editorial and rush it into the very next issue of The GOOD NEWS. And I hasten to assure all members of God's Church that all editors and writers for The GOOD NEWS and The PLAIN TRUTH shall have been severely cautioned and warned — before you read this — to be more careful and more diligent in checking what goes into these publications. Actually the article in question was written by a young man who is an advanced student at Ambassador College, not yet graduated. But it certainly was the responsibility of those of us who are God's ordained ministers of highest rank and are the Editors of the official magazine of God's Church, to check most carefully any article written by an unordained and inexperienced young man, before allowing it to appear in The GOOD NEWS. I personally apologize and assure our readers we shall try to be much more careful hereafter. The article in question began on page 13, issue of April, 1964. It is captioned "Is THE BIBLE A PROTESTANT BOOK?" Of course all members of God's Church realize, I'm sure, that most of the writings called the Old Testament were written, originally, in the Hebrew language, and all of the New Testament was written in the Greek. Our Bibles, in the English language, have been translated into English from the Hebrew and the Greek languages. The article in question was concerned with the Greek texts from which our English Bibles have been translated. I'm sure you also realize that today there exist only Hebrew 2nd Greek copies of the Scriptures. The actual pieces of paper, sheep-skin or papyrus on which Moses wrote — or on which Peter, Paul, or Luke wrote originally, are no longer in existence, as far as men know. These original writings were copied by trained and professional scribes or copyists. But there are hundreds of copies. The question in the article concerned which of these many, many copies in the Hebrew, and in the Greek, are the accurate and true copies, containing the exact Hebrew and Greek words that were in the originals. Humans make mistakes. Humans have done the copying. Which are free from either mistakes, or from deliberate alterations? The article gave PROOF that God used the Jews in preserving accurate and true copies of the Old Testament in h e Hebrew language. Also the article, at first, made clear that it was GOD who actually preserved the exact same words, in the true Hebrew and Greek copies, that He had inspired in the original writings. He merely used the Jews as His instruments in accurately copying and re-copying (as copies became used, worn, and old with age) the Hebrew texts of the Old Testament. All this was true and accurate. God actually committed the "oracles of God" — that is, the actual written words of these Scriptures — to the Jews (Romans 3:2). "Romans 1:16 reveals the answer. 'For I am not ashamed of the Gospel of Christ... to the Jew first, and also to the Greek.'" By omitting the vital words in the middle of the sentence — (and the three periods denote that words, supposedly without altering the meaning, have been omitted) and by emphasizing the words "also to the Greek," it was made to appear to say, "The writings, preservation, and transmission of the New Testament was committed to the Greek." BUT IT DID NOT SAY THAT AT ALL! The words left out of that verse were, and I italicize them here: "For I am not ashamed of the gospel of Christ: for it is the power of God unto salvation to everyone that believeth; to the Jew first, and also to the Greek." That is the whole verse. That verse DOES NOT SAY the Greek words were committed TO the Greeks. It says the POWER OF GOD UNTO SALVATION was PREACHED TO the JEWS — and then, secondly, also to the Greeks! It is not talking about preservation of Greek copies BY the Greeks, and denied to the Jews — as this article falsely claims — but of preaching the Gospel TO THE JEWS first and primarily — and then, also to the Greeks. It says SALVATION IS open to EVERYONE — first to the Jews, but ALSO to Greeks — EVERYONE! Brethren of God's Church, if I did not know that this was merely a careless mistake by an overly eager undergraduate college student, which through carelessness was not caught by any of us who are Editors, I would say that this is absolutely reprehensible! It slapped me a stinging blow in the face! I am mortified and ashamed! And I hasten to do what I can to CORRECT it! This verse HAS ABSOLUTELY NOTHING WHATSOEVER TO DO WITH COMMITTING THE PRESERVATION OR TRANSMISSION OF WRITINGS — THE NEW TESTAMENT SCRIPTURES TO ANYBODY — and, if it did refer to committing this custodianship to anybody, it says, PLAINLY", TO THE JEW FIRST." Notice the context. In the preceding verse, Paul desired to go to Rome "to PREACH the Gospel to you that are at Rome also." "To PREACH" — not preserve WRITINGS! Yes, I am shocked, humiliated, and ashamed. In all the years of my ministry as the called and chosen Minister of Jesus Christ, I have always tried, above all else, to be HONEST with the WORD OF GOD! I am sure there was no intended dishonesty on the part of this student writer — but I do promise you Brethren — God's flock, over which He has made me chief human overseer and shepherd — that there is going to be a definite "tightening of our belts" by the Editors of this magazine — and any further articles by younger, inexperienced, unordained men will hereafter be checked and double checked for accuracy and TRUTH! But that two paragraphs is not all. This young writer jumped to his conclusion from that one MISAPPLIED verse of Scripture, and based the remaining half of his article on it! Just two paragraphs later, he says. "We saw the principle in Romans 1:16 that God was going to use the Greek-speaking world to preserve and copy the New Testament canon." Brethren, as your Pastor General, I apologize for that and say to you, WE SAW NO SUCH THING in Romans 1:16! Again, two more paragraphs after that, he wrote: "But the Greeks were given the responsibility to copy and transmit the New Testament canon." And his next words are: "The truth of Romans 1:16...."
The very fact that the words above, "preserve and copy," and "copy and transmit," were emphasized in italics, makes the error the more glaring and INEXCUSABLE! I certainly never expected to see, in either The PLAIN TRUTH, or in The GOOD NEWS — both of which magazines God founded and established by me, this method of giving false and distorted and misapplied Scriptures as the basis for a conclusion, and then assuming the conclusion to be true! The only thing I can do now, is CORRECT it! Now in the paragraph last above quoted he mentioned "many interesting historical developments" as giving some indication that GOD preserved the Greek-language copies of the New Testament through the Greek people rather than by the ROMAN Catholic Church. And that is true. There are historical developments, some covered in the latter part of this article in question, which give indication that the GREEK copies, not the LATIN copies of the Roman Church, are the accurate ones. But the article seemed, from that point on, to assume that God turned the custodianship of the New Testament portion of HIS WORD over to heathen Gentile Greeks of the Greek Catholic Church, as if God had "bowed out," and we must RELY ON the Greek Catholic Church. THAT ASSUMPTION IS UTTERLY UNTRUE! Our sole RELIANCE is on the living JESUS CHRIST, and Almighty GOD the Father. It is GOD who has seen 10 it that men, in spite of themselves, have been made to accurately preserve HIS HOLY WORD! God's Church does not rely on the Greek Catholic Church. It is merely one branch of the FALSE Church founded by Simon Magus in 33 AD. We look to other, far more dependable factors to determine which are the accurate Greek texts. Actually, the CONCLUSIONS of the article were approximately the truth. No one would have been harmed or misled by the article — but it is simply intolerable to me to misapply, twist, or wrest GOD'S WORD, even to present a true conclusion. To confess and quickly to CORRECT a mistake is no sign of weakness, but of STRENGTH. I know of no other Church which has the courage to do it. Those in God's own Church must be humbled and completely yielded to HIM!